The vast pile of the Alexandra Palace still dominates a North London hill-top as the focal point of many vistas. It presents a spectacular aspect from the ridge of the hills nearer the metropolis, and is a long familiar sight to railway travellers on the main northern line from King's cross. Beyond the reservoirs, race-course and sloping lawns, the massive building sits solidly on its plateau, the survivor of two wars and many other vicissitudes. At its heart stands the long and lofty Great Hall, still popular venue for exhibitions, trade shows and the like. But, musically speaking, it has known greater days. Nearly half a century ago, Galli-Curci and Frieda Hempel were singing there to thousands, for, despite the buildings major dilapidations and the audiences' minor discomforts, concerts were given in the Great Hall throughout the `twenties. Until 1929 its chief glory remained silent. The organ `Father' Willis had built there in 1875 had been mutilated by vandals (wearing the King's uniform) who had wantonly wrecked the noble instrument, Willis's masterpiece, as a part or their armistice celebrations in 1918. Pipes and parts of the mechanism were found strewn not only in the building and park but even along the permanent way from Alexandra Palace GNR station to King's Cross. The story of the Alexandra Palace between the two world-wars was generally one of struggle against financial embarrassment. It was left to a voluntary committee to raise funds for the restoration of the Alexandra Palace's greatest single asset, and on December the 7th, 1929, the Lord Mayor of London was able to perform the re-opening ceremony of the famous instrument, restored by the original builder's grandson, as North London's memorial to Queen Alexandra. The organ with its four manuals and pedal division comprised ninety-eight speaking stops and thirty-nine couplers and the tone of the instrument proved incomparably majestic. Marcel Dupre declared it to be the finest concert organ in Europe, a view echoed by all who played it during the bare decade when it was sporadically heard on Sunday afternoons. Among them was the blind Andre Marchal, who described the restoration as the "veritable masterpiece of all modern organ craftsmanship", the younger, thirty-year-old Fernando Germani, and many famous native players, including G.D. Cunningham, who in 1901 had been appointed Alexandra Palace Organist at the age of twenty-three and whose Sunday afternoon recitals there had delighted a previous generation - until the Kaiser's war had stopped them! Cunningham was able to write - "Such a combination of tonal beauty and mechanical ingenuity make the restored Alexandra Palace Organ unique". As a recital instrument, then, the Alexandra Palace Organ proved unrivalled, but its concerted use with brass bands and orchestras was hampered by its pitch which still stood at C:540. The Restoration Committee had not raised enough money to lower this to C:522 at the time of the rebuilding, and the Alexandra Palace Trustees had other, to them priority, calls on their funds in the `thirties. So, once again, a voluntary committee came into being. The work of lowering the pitch was put in hand, and the sale of tickets for the great Handel Festival Concert on June the 3rd,1939, at which Sir Henry Wood conducted selections from Judas Maccabaeus, Israel in Egypt and Messiah and the Tenth Organ Concerto with Cunningham as soloist, raised more than the sum required to make up the cost. Although Cunningham survived the war, that was the last time that he played at the Palace. War was declared on September the 3rd and the recital that he was to have played a fortnight later was cancelled. The last public organ recital at the Alexandra Palace was given by Noelie Pierront on August the 20th, 1939. Nearly three years later, in wartime, Felix Aprahamian took two young R.A.F. bandsmen - one of whom had written an organ sonata for the other to play - up to the Palace to try it through. Those brave Wagnerian sounds might have been written with the Alexandra Palace instrument and ambience in mind. The young composer's name was Norman Del Mar, and his interpreter, another R.A.F. horn-player, Dennis Brain, F.R.C.O.. The Great Hall was closed, but the organ was played privately, perhaps less memorably, on a few other occasions until, in 1944, one of Hitler's Doodlebugs' exploded just outside the organ end of the Great Hall, blowing in the rose-window behind and above the organ. The instrument itself remained intact, but the rains came, and, long before the necessary protective steps could be taken, 'Father' Willis's masterpiece was wrecked for the second time by the elements. Following the end of the Second World-War all of the pipework and much of the mechanism was removed from within the organ casework and placed in large rooms, behind the organ, until such time as money could be found to restore it (War Damage reparation was paid on the organ, but then diverted to other channels deemed more necessary to maintain the building). Then, the GLC who were the owners of the Palace decided that it wanted rid of the organ and it was offered for sale. As is always the case with such matters where there is money involved, there was some concern about the fact that a Scrap Merchant 'friend' of a Council official was said to be the 'front-runner' in the acquisition proceedings! There was a rush of activity which resulted in Henry Willis 4 being persuaded to join with one other person in bidding for the organ and, finally, they succeeded in their bid. However, the other person turned out to have no money and therefore, by default, Henry Willis became the sole owner of the Ally Pally organ. Having sold it, the Council decided that it could not possibly let the casework and thirty-twofoot front pipes be removed from the Great Hall as this would leave a gaping hole in the concrete tiered orchestra and therefore Henry Willis allowed these to remain in-situ. In 1980, a disastrous fire destroyed the Great Hall and the casework and thirty-two-foot stops which remained in it - thankfully, most of the other pipework and mechanism from the organ had been removed from the Palace by Henry Willis 4 many years earlier for safe-keeping after it was discovered that the Willis padlocks had been struck off the doors to the rooms were it was stored. An horrific amount of damage had been caused to the pipework by the Palace staff shooing pigeons out with sweeping brushes and other implements and it was therefore decided that only way to protect it from further damage was to remove it to the Willis factories at Petersfield, Liverpool and Huddersfield. When rebuilding and 'restoration' of the Great Hall had been commenced, it soon became apparent to members of the Appeal committee that the massive over-spending on certain features of the project would rule out the possibility of anything being left to restore the organ. A new Appeal was launched under the Chairmanship of Felix Aprahamian to set about raising the necessary funds. By the time that the Great Hall rebuilding was nearing completion, a sum had been raised that was sufficient to place an order with Henry Willis and Sons Ltd. to restore at least a part of the organ. It was decided that a small part of each of several divisions should be commenced in order to give a more balanced effect than simply restoring a complete division and a total of thirty-three stops were unveiled to the public at an opening concert in 1990. It was soon realised that this restoration was tonally faithful and the effect of the organ in a much-changed acoustic was very much as the old organ had been in the old Great Hall - several elderly men who had remembered the organ pre-war were almost in tears at hearing it again! Unfortunately, due mainly to the worsening recession but also, latterly, to a lack of drive in the Appeal's management, no further work was carried out for several years until a change of management began in earnest to raise more money. By 1995 all of the Choir organ had been restored and installed and, even with the recession still gripping the country, more money was raised. In December 1995, the Choir organ was enclosed in its expression box, the Swell moved to its new, permanent position and enclosed in a new expression box. At this time, there are fifty speaking stops restored and therefore this mammoth undertaking is over half-way towards completion. The relationship between the Appeal committee, the Palace Management and the Organbuilders is more genial that at any other time in its history and the restoration enters a new phase as the public awareness for the need to prevent the erosion of our national heritage increases. This disc comprises recordings made of the finest organists of their day, recorded by the finest technicians. These recordings were carried out with equipment which was, by modern standards, extremely primitive: but it is, in the writer's opinion, because of the lack of technological interference that the results are superb. The accommodation of dynamic range is quite beyond almost anything else of the period and it is obvious that those involved knew exactly, and understood the nature of, the sound that they were involved in capturing forever. This Compact Disc follows closely the format of the now-legendary LP,'The Alexandra Palace Organ', issued in 1970 and long since deleted. We have added five new titles and deleted one which is available elsewhere. EMI have re-transferred all of the original 78s with vastly improved results, thanks to state-of-the-art technology and the highly-skilled Abbey Road Studios staff. Organists who were asked to make recordings in the'twenties and'thirties often found their efforts at the sessions somewhat restricted - possibly more than any other recording artists. They were frequently instructed not to exceed certain set limits in their registration - no 16 foot doubles on the manuals, no 32 foot stops on the pedals and no sudden surges of power. Sometimes even pedal stops with a strong tenor register has to be avoided (and in this respect the slightly imprecise pedal entries in G.D. Cunningham's C major Fugue by Bach -Track 4-might well have been the result of the recording engineer's wagging finger!). The technical staff only needed to observe the 'sheen' on the newly-recorded wax to know whether the dynamic levels had been exceeded. When this occurred, the artist was simply asked to repeat the performance. However, organs and their respective locations have always varied considerably. Organ recordings at London's Queen's Hall, for example, were noted for their clarity, being relatively free from distortion-despite, as in the case of Marcel Dupre's discs, the use of heavy manual and pedal stops. Dupre had signed a contract with His Master's Voice in 1924, and we can cite one instance recorded some four years later. In his recording of Bach's C minor Fugue (BW V537) Dupre was able to extend the last six chords an octave higher, filling in the harmonies in both hands, all underpinned with a terrific 32' pedal - and the engineers were able to take it. Dupre's recordings at the Alexandra Palace are no less exciting, even though the difficult acoustics of the hall presented problems for the technical Staff. Before the sessions, Dupre would cheerfully agree to the limitations, and - equally cheerfully -proceed to use all of the'forbidden' stops with a vengeance, thereby breaking all the rules! He used the 32' reed many times on the Palace recordings, and always to great effect. Twice in the Widor movements be doubles the pedal line an octave lower than written with the full pedal organ in action, and the recording engineers were still able, nevertheless, the 'pass' the recording for production. Also sailing close to the wind was George Thalben-Ball. His'Ride of the Valkyries', done with enormous drive, panache and firm control, contains some remarkable swell-pedalling - the "terrific roar" (his description) of the swell shutters opening is well illustrated here. It was done in two 'takes': the second was pressed as 'Master'. While the refined and highly-disciplined performance of Walter Alcock portrays another aspect of British organ playing, Cunningham's prodigious and well-oiled technique is much in evidence in his Bach (played at high speed) and the first movement of Elgar's Sonata. On the lighter side, Goss-Custard's well-managed crescendi are a feature of his Romantic approach, and his finely-balanced Saint-Saens transcription exposes the Solo registers to good effect. Arthur Clarke, Douglas Larter, George Dillnutt, Edward Gower, F. Bulkley,S.E. Tunn, and also Harold Hands, who assisted in the recordings in many different ways. MARCEL DUPRE (1886-1971). The most famous organist of his time.A native of Rouen and pupil of Charles-Marie Widor, he succeeded his master as organist of Saint-Sulpice in Paris in 1934. GEORGE DORRINGTON CUNNINGHAM (1878-1948). 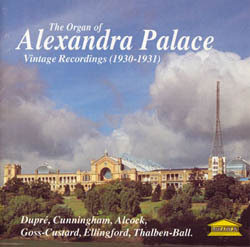 London-born, G.D. Cunningham was appointed as Alexandra Palace Organist in 1901. The best-known English organ recitalist of his day, he became City and University Organist of Birmingham in 1924. WALTER GALPIN ALCOCK (1861-1947). Sir Walter Alcock was the doyen of English organists at the time of his death. Born in Edenbridge, he studied under Sullivan and Stainer, became assistant to Bridge at Westminster Abbey before his appointment to Salisbury Cathedral in 1916. He played the organ at the Abbey for three Coronations. REGINALD GOSS-CUSTARD (1877-1956). A native of St. Leonards and largely selftaught, Reginald Goss-Custard was successively organist of St. Margaret's Westminster and St. Michael's Chester Square. He was also organist for many years at the Bishopsgate Institute, where his two weekly recitals formed the basis of his reputation as a concert organist rather than as a church musician. On the advice of Cunningham, Goss-Custard was appointed as Organist of the Alexandra Palace after the 1929 restoration of the organ. HERBERT FREDERICK ELLINGFORD (1876-1966). A pupil of Sir Walter Parratt, he was for some years organist at Holy Trinity, Southport. On the death of Albert Lister Peace he was appointed as Organist of St George's Hall, Liverpool from 1913 to 1940: he gave over 1500 recitals on the great Willis organ. GEORGE THALBEN-BALL (1896-1987). After Cunningham's death in 1948, Thalben - Ball was the most famous English organist of the time. Australian-born (he was a native of Sydney) he succeeded Walford Davies as organist of the Temple Church in 1919. He succeeded Cunningham as Birmingham City Organist in 1949.
in the two Widor items, Dupre's texts arc those of an early edition of the Symphonies (i.e. before 1901) with a few minor variations ofhis own. These include the omission of the low pedal C, bars 100 to 108, in the Allegro from the Sixth Symphony. Cuts in the musical text in order to accommodate the restrictions of the 78 rpm format occur in tracks 1,2,3,4 (Toccata only) and 14. The master tapes used in the production of this Compact Disc were donated by Abbey Road Studios/EMI Records (UK) Ltd., to the Alexandra Palace Organ Appeal. Digitally remastered using Sonic Solutions and Cedar by Andrew Walter and Peter Mew. Music Editing and CD PreMastering by Peter Vince. Musical Adviser for the project - David Bell. Grateful thanks to Ruth Edge, EMI Music Archives, and the National Sound Archive. 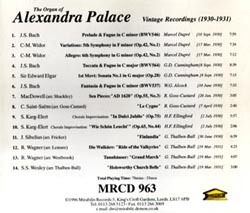 Mirabilis Records has produced this disc in association with the Alexandra Palace Organ Appeal.